Why Did You Build a Stone Circle? We get lots of people passing through Earthwood Building School in West Chazy, New York. Most of them, truth be told, come here to learn about cordwood masonry construction, or underground house building. My wife Jaki and I have been teaching those alternative building methods at our homestead and school for a quarter century. 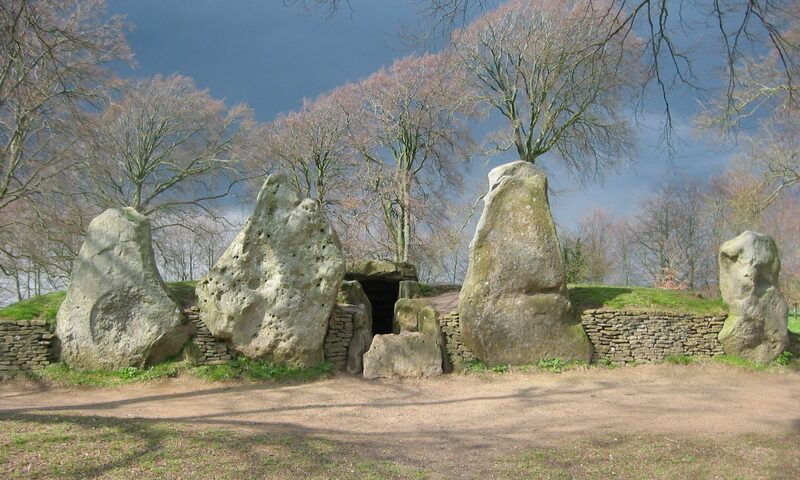 But the first things that visitors notice when they arrive are the megaliths, the giant standing stones. In fact, they are greeted by the six-foot tall, 3000-pound Gate Stone when they turn in the driveway. By the time they get close to our round cordwood masonry earth-shelter, the Earthwood Stone Circle is in full view, and many visitors are torn between looking at the building techniques that they came to see and this new evocative apparition which suggests an ancient time and an ancient technology. My writing is disturbed by Holly, our loudly barking German Shepherd, so I go to meet the visitors, which also serves to allay most of their fear when Holly comes barking up to them in greeting. “Why the stone circle?” is the first question, often as not. Another one, almost as popular is, “How did you move those stones?” Easy questions to ask, not so easy to answer. I know because I’ve been on both sides of them. Over the past five years, I have visited dozens of modern stone circles throughout the world, and I ask the same questions, because I have a long-standing curiosity about these things. In this article, however, I will keep to my own answers, at least for the most part. I was most impressed with the size of these standing stones, some over 20’ high and 40 tons in weight, and supporting cross-members called lintels in the 5 to 10-ton range. How did they do it? We may never know the true answer to that question, but it is one which I have been working on for the past 35 years, and I have come up with some possibilities. In July of 2002, we’ll be putting some of these ideas to the test when, at a megalithic workshop, we attempt to raise a stone in the 20-ton range, and using only “equipment” which would have been available to the ancient builders. After visiting Stonehenge, I knew that someday I would have to build a stone circle of my own. Why? The only explanation I can give is that I was compelled to build it, just as the Richard Dreyfuss character in Close Encounters of the Third Kind was compelled to build a large replica of the Devil’s Tower mountain in his front yard. Incidentally, compulsion is a reason I have heard given by at least two other modern stone circle builders. Others have had what might be considered better reasons, reasons which may reflect the motivations for the original rings of 5000 years ago. Archaeological and other evidence suggests that the stone circles served the same purposes as churches in the Middle Ages. They were used as temples for observing the important holidays and life events, like baptism, rights of passage, marriage and death ritual. Many of our Christian holidays, such as Christmas itself, derive from ancient pagan holidays, which were usually placed to mark the sun’s important risings and settings, as on the longest or shortest day (the solstices) or on the vernal or autumnal equinox. Ancient “cross-quarter days,” such as Samhain, have become our Halloween or All Saint’s Day. By 1987, Jaki and I reckoned that, finally, we had the discretionary time and money to build a stone circle. We also had the stones, thanks to the extraordinary geology of Murtagh Hill, and to the willingness of neighbors to part with stones on their property. A lot of time went into finding and cataloging the available material, and also in design. I strongly advise designing the circle after you know — intimately — the stones you have to work with. Trying to meet a particular design by finding the necessary stones can lead to great frustration or great expense. The actual raising of the 12 large standing stones at our circle took just a week-end, and $500 worth of backhoe work. Eight of us attempted to erect the last stone — a two-tonner — by hand, and we almost succeeded before running out of daylight on a late October, Sunday afternoon. Score one for the ancients. Now, using methods which we have learned in the past five years, Jaki and I would feel confident in raising this size of this megalith by ourselves. The secret is to move at the speed of the stones.